Artist Scarlett Raven unveils her ambitious, groundbreaking visual arts experience, The Danger Tree this summer. Scarlett is the first oil painter to work in the exciting world of augmented reality and reveals the deeply personal process of creating her multi-layered, experiential art. Working exclusively with Blippar, world leaders in the field of augmented art, the viewer can use their smartphone app to unlock Scarlett's poignant work, stripping away the countless layers of paint to reveal the creative journey beneath each painting. On 1st July 2016, Scarlett Raven will launch her trailblazing new project The Danger Tree to commemorate the 100th anniversary of the Battle of the Somme. Award winning film set designer Kave Quinn will magically transform a 2,000ft space in Greenwich to create a blown out building from the French/Belgian borders. Parts of the exposed roof and walls will echo to the sounds of war as each of Scarlett's paintings appear hanging from the walls still extant, each beautifully lit and positioned to take the viewer on an incredible journey. We begin the experience at the danger tree, through to the moving penultimate painting Black Poppies and the final painting, The Soldier, a reflection on all we have seen. The collection will challenge us to view alternative versions of the multi-layered, immersive work, seen through the words of the war poets and movingly expressed by leading British actors, Sean Bean, Christopher Eccleston and Sophie Okonedo. Scarlett’s new collection of work is inspired by the legendary WW1 poets Wilfred Owen, Siegfried Sassoon and Rupert Brooke and is a memorial tribute to the Newfoundland Regiment who used a tree about halfway into "No Man’s Land" to gather. Regrettably the tree was highly visible to German artillery resulting in many casualties and it became known amongst the soldiers as The Danger Tree, a replica of the twisted tree now stands to mark the spot. In May, Scarlett created an augmented reality painting for mental health charity MIND, which revealed her own personal battles with deep anxiety issues. The painting included hundreds of ‘selfies' from other people who have been helped by MIND and whose self-portraits are now enshrined within the work. Again, these hidden layers are revealed with exposure to the Blippar App. The painting, titledOne in Four, in reference to the number of people to experience mental health problems, fetched £13,000 at an auction to tie in with MIND’s 70th anniversary. Street Gallery she presented Flight. 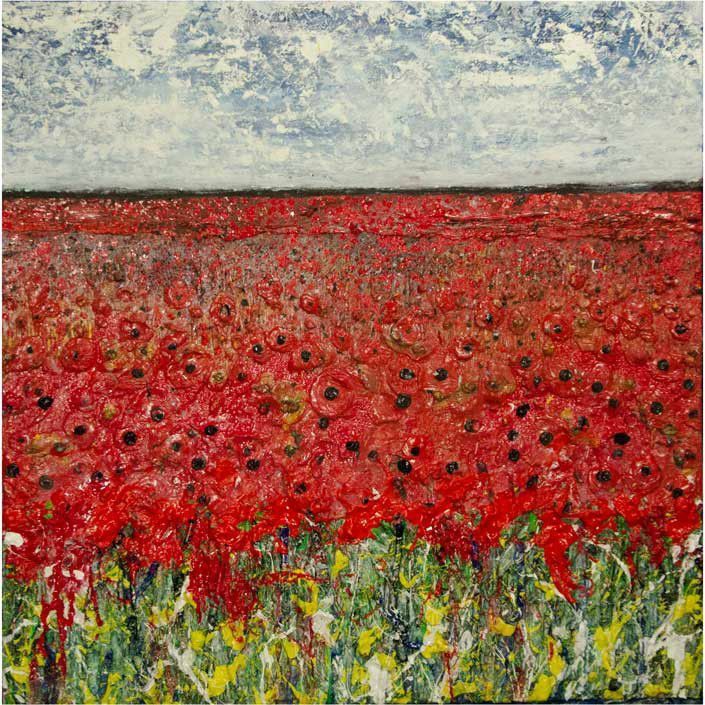 Her solo exhibition The Eleventh Hour at Castle Galleries, Bruton Street in 2014 was in collaboration with The Royal British Legion, commemorating the centenary of WW1 and emphasised the importance of remembrance and the enduring symbolism of the poppy. Scarlett’s print edition work is exclusively published by Washington Green Fine Art, the UK’s leading art publisher, and is available to buy from Castle Fine Art galleries nationwide. The Blippar Experience: Download the free Blippar app on your smartphone to unlock Scarlett Raven’s augmented reality paintings. Further information at www.blippar.com.